For the asking price, the Logitech G512 is probably one of the sharpest additions to the company’s gaming keyboard range in quite some time. Logitech’s G gaming sub-brand has, in the past, overshot the mark a little. For all the times where they’ve managed to succeed in reinventing the wheel - last year’s PowerPlay wireless gaming mouse is a good example - there are plenty more where they haven’t quite lived up to their own hype. Bells and whistles can catch your eye - but solid fundamentals are usually the key ingredient when it comes to actually earning the loyalty of gaming audiences and holding onto it. After all, once earned, that kind of brand loyalty can be difficult to shake. The new Logitech 512 Carbon feels like a product that’s trying to foster that kind of brand loyalty. It’s dead-simple to set up and use. It’s cleanly designed and well-built. It’s got a good price-point and it gets the job done. What more could you want out of a keyboard? The Logitech G512 Carbon boasts a classic-but-winning combination: a sturdy aluminum alloy chassis with with a gorgeous brushed metal finish. There’s not a huge amount going on here but there’s enough to like about it. Beyond the material details, the G512 is a pretty conventional, albeit slimline, mechanical keyboard. It’s easily comparable to the HyperX Alloy FPS Pro in that there’s little wasted space and it looks right at home on your desk. There’s also little in the way of media keys, which might irk some. However, as someone who has rarely found inclusions like that add enough to be worth the space they occupy, this wasn’t really an issue. Of course, like any gaming product, the Logitech G512 also includes a bunch of RGB underlights. 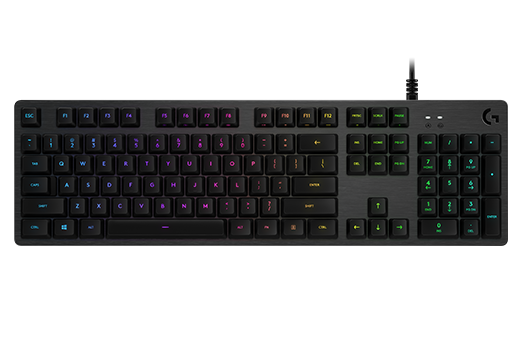 The keyboard boasts full RGB per-key backlighting. Customization and control over this feature is handled by the company’s own (creatively-named) Logitech Lighting Software. In theory, this offers up all the usual options and, in practice, it looks just as visually engaging as other RGB keyboards like it. You can configure specific patterns, both static and active, and it does link up nicely with the rest of Logitech’s RGB-enabled kit. In a move that grants it form of parity with the gold standard for RGB-integration, the Logitech G512 also boasts surprisingly-comprehensive integration on a software-level. It’s not quite as accomplished as Razer’s solution when it comes to automatically delivering an interesting and unique RGB experience based on the game. However, Lighting Software does support per-game profiles and allows you to make RGB configurations based on not just specific key-presses but also relevant in-game functions. There are over 600 supported games, with all the major titles present and accounts for. Unfortunately, it doesn’t have quite the granularity or depth found in Razer’s Chroma system. Logitech's Lighting Software supports a unique RGB configuration for Overwatch but doesn’t support unique RGB configurations for each playable character in Overwatch (which Razer's does). Of course, the biggest difference here between what Logitech are offering with the G512 is the Romer-G switches on the thing. Proprietorially-developed by Logitech themselves, Romer-G key switches are what the company envision a modern successor to Cherry MX might look like. That’s a pretty bold claim. However, according to Logitech, Romer-G’s offer up better lifespans and have been engineered specifically for gaming use-cases. By comparison, Cherry MX switches have been popular among gamers but originally designed with typing in mind. Romer G’s require 45g of actuation force to press across the board, making them pretty comparable to select (but not all) Cherry MX switches. Of course, this has to be counterbalanced against the fact that Logitech’s Romer-G keycaps can’t be swapped or customized out as easily as their Cherry MX counterparts. Time will ultimately tell whether Romer-G switches do actually prove a viable competitor to Cherry MX ones. However, for our money, typing on the G512 felt as response and satisfying as we needed to be. It also came with all the expected perks. The G512 has 26-Key Rollover and Anti-Ghosting built-in. There’s also dedicated gaming mode that disables the Windows Key. Again, all the usual suspects are here and all the usual boxes have been ticked. Putting the perks aside, The Logitech G512 sounded and felt different to a Cherry MX keyboard but I don’t know if I would go so far as to say they sound better than one. That said, the G512 does come in at a price-point slightly lower than Logitech’s comparable Cherry MX-products - which isn’t a detail worth discounting. If you’re the kind of person who wants that mechanical keyboard experience and isn’t fussed with the details, you’ll probably be happy with what Romer-G switches have to offer. However, if you’ve already sunk money into a nice Cherry MX keyboard - it’s probably not worth replacing it for a Romer-G one just yet. For the asking price, the Logitech G512 is probably one of the sharpest additions to the Logitech’s gaming keyboard range in quite some time. It’s not the cheapest keyboard around, but it doesn’t have to be. If you’re looking for just a little bit more color than what’s on offer from the HyperX Alloy FPS Pro and are happy to make the jump from the tried but tired experience offered by Cherry MX switches and give Logitech’s Romer-G solution a try, you’ll probably come away mostly pleased with the results. After all, they’re fundamentally solid.